We're on a mission to offer the best Internet service for the best price. It's the ultimate first-world problem: Internet that starts out affordable and then suddenly isn't. That's why we're on a mission to offer the best Internet service for the best price—and a set price that won't go up. Now you can finally have Internet with faster speeds, a lower price, and award-winning customer service. Get high speed Internet for less. Right now. There's nothing more frustrating than bad Internet. You've had enough waiting and teeth grinding to last you a lifetime, so let's get rid of that 7:00 p.m. slowdown. Finally. 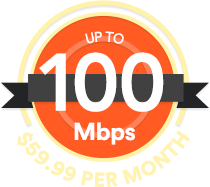 Not just anyone will give you up to 100 Mbps for $59.99. Now you can afford a speed that will let everyone in your house surf the Web, watch Netflix, and stream their music without all that buffering. You know the drill: signing up for a decent "promotional" price, then scrambling to cancel before that price doubles. Call us today to discover how to keep the same great price for years and years to come. For our customers that would like additional help keeping unwanted content out of your home, we now offer the Circle with Disney. This device will help filter out material that may be harmful to minors. Call our team to set up your order. With Vivint, I’m getting a faster and dependable Internet service for a lower monthly fee. It’s really a no-brainer. We own innovative and smart technologies, and our Internet seemed to slow us down from maximizing their full potential. With Vivint Internet, we’re no longer being limited by our Internet speed. My Vivint Internet is faster than any Internet service I’ve ever used, including the Internet available at any office building or hotel I’ve ever been to. I rely on my Internet connection for work. When I’m hosting a webinar that’s spanning the country, I need a reliable connection that loads fast, doesn’t flicker, and transfers my content smoothly. With Vivint, I get all of that and an uninterrupted connection.